Steel Europe, to SAIL to JSW are moving deeper in the red with no hopes of early revival in sight. For its sheer size, manufacturing presence in four continents and a rich product profile with leadership status in auto-grade and electrical steels, ArcelorMittal is seen as the bellwether of the global steel industry like Alcoa for aluminium. Not only did the company, which shipped 84.6mt of steel last year, chalk up a record net loss, but its projection of $4.5bn earnings before interest, depreciation, tax and amortization in 2016 against $5.2bn last year will actually work out to a fifth straight year of loss. Explaining the setback in 2015 working, the company said it fell victim to declining steel prices caused largely by a surge in Chinese exports and to large write-offs in its mining business. give one example, prices of hot rolled coils finding use in automobiles and other manufacturing areas was down nearly 40% last year. Chinese provinces hosting steel mills have left the world in no doubt that it continues to provide large dollops of subsidy. Specialist publication Metal Bulletin says in a report that Chinese companies are found exporting steel at prices 10% below they charge locally. This, according to The Economist, is textbook definition of dumping. Trade action against imports of subsidised steel mainly from China but also from Russia and some constituents of CIS (Commonwealth of Independent States) is growing. The Indian government recently imposed MIPs ranging from $341 to $752 a tonne on 173 of 343 principal steel products. MIPs are valid for six months. The injured industry both in the US and European Union continues to pursue trade actions against imports. A responsive US government has come to the help of local steelmakers by imposing anti-dumping duties of as much as 236% on some varieties of corrosion resistant steel. The slow-to-act European Commission (EC) has finally introduced provisional 13.8% to 16% duties on imports of cold rolled flat steel (CRFS) from China. Imports of the product from Russia will invite duties ranging from 19.8% to 26.2%. China and Russia combined have a share of 55% of the European Union CRFS market. The EC has also opened fresh anti-dumping investigations into three categories of steel products, namely, hot rolled flat steel, heavy plates and seamless pipes from China, bringing the total number of anti-dumping measures relating to the steel industry to 37 and the number of open investigations to nine. Mittal’s perception is that Europe is less effective in giving legitimate protection to its producers than the US. “Clearly the trade defence instruments that have been developed in the US are better. They ensure a fairer level playing field,” he said. The genesis of present steel problem of excess capacity, falling demand and low prices is to be found in China accounting for nearly half the global production. The estimated excess world steel capacity is about 600mt with China accounting for as much as 300mt. China, which more than two decades ago launched a drive to build a strong infrastructure and become a factory to the world considered it wise to source all the steel needed for the purpose from within. That the country does not own quality iron ore resources has not proven to be a deterrent. So China’s steel production rose from 66.350mt in 1990 to 128.5mt in 2000 and to an all-time high of 822.698mt in 2014. Even while its steel production was down 2.3% to 803.8mt in 2015, petering out of construction boom and fall in exports of engineering goods left it with considerable steel surplus which had to be exported. For China the official purchasing managers’ index (PMI) of manufacturing activity and that of leading financial magazine Caixin are below 50, the threshold indicating contraction. The January issue of the World Bank’s Global Economic Prospects says world growth slowed to 2.4% in 2015 and is likely to recover to 2.9% as modest recovery in advanced economies continues and activity stabilizes among major commodity exporters. Yes prices of iron ore and steel have improved in the current year but their sustainability remains in doubt. World trade growing at a lower rate than GDP expansion has negative connotations for the steel industry. Prior to the 2008 financial crisis, global trade would grow faster than GDP. World trade volumes grew by 2% against GDP progress of 2.4% last year. How is the steel industry going to fare in 2016? Lakshmi Mittal says: “Looking ahead, although we have started to see a recovery in Chinese steel spreads from 2015 lows, 2016 will be another difficult year for our industries. It is clear that China has a challenge to restructure its steel industry for a lower growth economy, but we are somewhat encouraged by recent comments concerning capacity closures. Until this situation is fully addressed the effective and swift implementation of trade defence instruments will be critical and we expect to see more positive rulings in this regard during this year.” Mittal is right on trade defence actions gaining in rapidity as recent rulings in EU and India will show. As was in evidence in the past two years, China will continue to grow slowly as president Ji Xinping is moving the country away from an investment-led to a consumption led growth model. This cannot but have a direct impact on global steel demand as manufacturing industries in developed economies feel the heat. A demand forecast by ArcelorMittal for 2016 shows it will either be flat or at the best growth will be 0.5%.The only bright spot in an otherwise dismal table is the US where steel demand is forecast to rise between 3% and 4%. China will see steel demand deceleration between 0.5% and 1.5%. EU may not show any demand growth at all or a marginal 1% rise in steel use. CIS is to experience a demand fall of up to 6%. But why is not India in the ArcelorMittal table since steel demand there was up 4.2% to 65.91mt in the first ten months of the 2015/16 financial year to end in March? In a demand forecast made in October 2015, World Steel Association said India would consume 7.6% more steel at 87.6mt in 2016 calendar year. A major fallout of steel crisis, particularly manifest in India is consigning of a number of ‘mega’ steel projects to cold storage. Posco wanted to build a 12mt steel complex in four modules of 3mt each in India’s coastal state of Orissa. The project would have required an investment of at least $12bn becoming the single largest foreign direct investment in India. Though not officially declared as abandoned, it is as good as dead. ArcelorMittal, which during better times wanted to do more than one ‘mega’ projects in India called it a day early last year. JSW Steel, India’s largest private sector steel group, has abandoned two ‘mega’ projects — one each in mineral rich Jharkhand and West Bengal. At the same time, many expansion programmes of steel groups have been put on hold. It is now to be seen how much of the Indian 300mt steel capacity target will be achieved by 2025. Hit hard by the sharp downturn in the Brazilian economy during the past couple of years, and by a sharp fall in prices, Brazil’s steel industry — a few years ago the world’s fourth largest, but now the seventh — is facing enormous challenges, writes Patrick Knight. 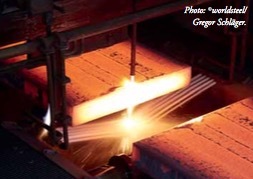 Close to a third less steel was sold in Brazil last year than in 2014, a reduction of 6.2mt (million tonnes). Although companies managed to export 14mt of steel in 2015, 40% more than in the previous year, the low prices fetched by this steel, caused largely by intense competition from cheap metal shipped by China, meant that most exports were not profitable at all. Despite the fact that so much more went abroad last year, exports earned 3% less than the much smaller quantity of steel exported in 2014 had done. The profits of most companies have disappeared, causing the price of their shares to collapse to the point that trading the shares of giants CSN and Usiminas on US stock exchanges, may have to be suspended. With demand at home expected to slow further this year, and with exporting no longer profitable, companies are cutting production. One of Brazil’s largest mills, the 5.4mt-capacity Cubatao complex in the port of Santos, owned by Usiminas, has been completely closed down. The largest company, CSN, has closed one of its three blast furnaces at Volta Redonda, Rio de Janeiro. One of three slab mills operated by Arcelor Mittal in Tubarao, Espirito Santo state, has also been closed. Sales and activity by all the industry’s leading customers, notably the motor industry, which sold 26% fewer cars in 2015 than in the previous year, the fewest for nine years, have slowed sharply. Last year’s fall was the sharpest year-on-year for 28 years, and fewer cars will be sold again this year. Sales of other consumer goods, such as refrigerators, and other white goods, have fallen as well. The construction industry is another leading user of steel, in this case mainly of ‘long’ products, rather than the sheet steel used by the motor and consumer goods industry, and thousands of construction workers have been laid off. The number of houses being sold and the number of starts made on new buildings, has fallen sharply. The government had planned to compensate for the falls in output by industry and civil construction by encouraging a switch to infrastructure building. But the government’s finances are now in such a mess, that no funds are available for this to happen. The cuts in production, which have helped trigger a reduction in retail sales, coupled with the deep financial difficulties facing the public sector, are causing an explosion in the numbers unemployed. Like those in most developed countries, many Brazilians had borrowed more to allow them to purchase more consumer goods and houses or flats in the past few years. But more than two million have lost their jobs in the past few months, and with many more threatened with lay offs, or seeing earnings fall, those millions are having great difficulty keeping pace with debt repayments, so are cutting back on all types of purchases. their policies in the 13 years they have been in power. But the situation has changed drastically in the past two years and the future looks gloomy. There seems to be little hope of economic growth returning for several years. The steel industry expects to make 6% less this year than it did in 2015, both because domestic demand is expected to continue to slip, while exporting at a loss, as occurred in 2015, is not a long-term solution. With most companies making losses, the industry has called on the government to raise tariffs on imported steel from the present 6–8% to 35%. But because the Brazilian currency, the real, has lost about 40% of its value against the US$ and other currencies in the past year or so, imports have already become much more expensive. In contrast, most Brazilian-made goods have become more competitive in world markets. All those using steel have been quick to point out that with demand for so many goods so weak, if the price of a key component such as steel were to be raised at the moment, as the industry would like to do, sell even fewer goods would be sold. So far at least, the government seems to prefer the arguments of the users of steel to those of the steel makers, and has refused to raise tariffs. As readers of this publication know well, Brazil is a leading exporter of numerous commodities, both of minerals such as iron ore, and agricultural goods, with the leading market for many of these being China. Cuts in demand by China for several types of goods, notably iron ore, as well as pig iron, have hit the Brazilian economy hard. There is some good news to compensate for this, however. For many years Brazil’s imports cost more than its exports earned, partly the result of the currency being overvalued. But now that the prices of all imported goods, notably manufactured goods, have risen sharply, demand has fallen, while export earnings have held up better, aided by the weaker currency. Because of this, trade moved into surplus last year, easing the pressure caused by the fact that virtually all other economic pointers, notably inflation and the current account deficit, as well as growth have all deteriorated. The slowing of the Chinese economy is not the only difficulty facing Brazil’s economy at the moment. Together with the problems faced by the steel industry, the collapse in the oil price is another serious problem, which is affecting the steel industry. the windfall caused by the discovery of so much oil as wide as possible, the government decreed that a high proportion of components should be made in Brazil. This was aimed at boosting a wide range of industries, and would increase the demand for steel. Brazil’s original shipbuilding industry had collapsed because vessels made there cost far more than those made in Asian countries. Local shipowners refused to buy them, and the industry faded away. Even before the new oil finds were made, increased demand from oil company Petrobras had helped the industry to recover. But not only has the sharp fall in the oil price hit Petrobras hard, forcing investments to be slashed, the company has become involved in a massive corruption scandal. It has come to light that numerous top Petrobras directors, most nominated by the political parties which form the government, rather than of experts from within the industry, were siphoning off billions of US dollars. Many suppliers, amongst them many of Brazil’s largest companies, were also involved in the scandal. Petrobras used to be a darling of foreign banks and international capital, and had borrowed several hundred billion US dollars to finance its expansion plans. Following the sharp fall in the price of crude, it became apparent than many projects are no longer viable, so bad news for the steel industry. Although output by Brazil’s manufacturing industry, hit by pressure from lower-cost imports has been shrinking, until two years ago, demand for electricity has been growing fast, boosted by the sale of more consumer goods, notably air conditioning units, as well as informatics and other electronic goods. But as the economic difficulties worsened, demand for electricity has fallen in the past couple of years, so building several large new power stations, a major market for steel, has now slowed as well. Brazil’s political system has come under tremendous pressure in the past few years. President Dilma Rousseff, earlier a minister of energy and on Petrobras’s board, is suspected of knowing about the corrupt deals, and has come under strong pressure to resign. The ruling Workers Party, whose policy of re-distributing wealth resulted in many millions becoming better off, is finding it extremely difficult to jettison so many of its cherished policies, such as higher pensions, and various social payments, now that times are tougher. The government’s reluctance to change, means that the tough decisions needed to restore the Brazilian economy, and with it the steel industry, have not been taken. So there is little chance of the situation improving for several years yet.